Copenhagen Town Hall with its 107 metre high Tower - Clock and Carillon - plus the Dragon Fountain. When a person stands at the side of the square granite Zero Kilometre Stone (former mile stone) at Copenhagen’s Town Hall Square - then one is actually situated right in the middle of the city centre of Copenhagen. The Kilometre Stone that is located just beside the Dragon Fountain on the Town Hall Square - was erected in 1925 - and is a monument that indicates the point - where the former West Gate (Vesterport) was placed - but also as a Zero Stone that informs the kilometres to various city and towns on Sealand. The Zero Spot in Copenhagen - and the Town Hall Square is the most expensive piece of land and property in Denmark - and certainly the most bustling hotspot and melting pot in town. And the New Metro Station is placed just beside the Town Hall. The absolute geographic mid-point of Denmark is placed at “Nørrevang” - on the peninsula of Odsherred in the north-western part of Sealand. 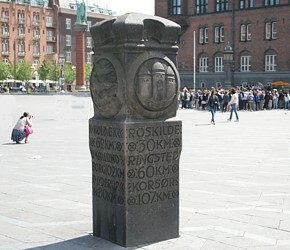 The granite Zero Kilometre Stone (former mile stone) at Copenhagen’s Town Hall Square is placed right in the middle of the city centre of Copenhagen. The Kilometre Stone was erected in 1925 - also to indicate - where the point of the former West Gates (Vesterport) was situated. There are all sorts of activities daily on Town Hall Square counting events - arrangements etc. 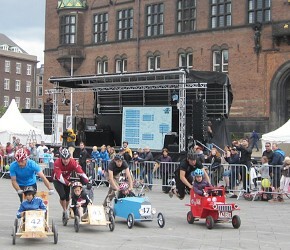 The photo shows the yearly Danish Championships in Soap Box Car racing - which is being held together with many enthusiastic spectators and participants - that just enjoys being the centre of attraction. 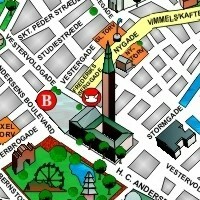 The Melting Pot of the City with numerous Activities - Arrangements and Events performed yearly. Events - Social Gatherings - Concerts - Street Theatre - Demonstrations - Sport Arrangements - Carnival Parade - Cultural Meetings - Exhibitions - Street Acting - Hot Dog Stands - Entertainment - Musical Performances - Festivals & Fairs - Living Statues - Circus Activities -International Artist - Political Festivities - - Commemorations - Celebration Parties etc. The Town Hall Tower Clock. 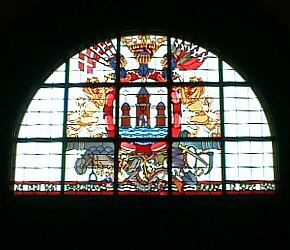 Colourful Glass Mosaic Window with Copenhagen’s Coat of Arms. 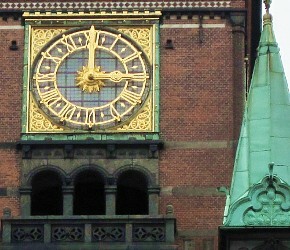 The Town Hall Tower Clock was inaugurated in 1905 - and has since been an indispensable sound for the Copenhageners with the very recognisable chime every 15 minutes - when the bells spread their joyful jingle all over the city of Copenhagen - which is a enjoyable and very dependable element in the Copenhageners every day lifestyle. Over the head entrance to Copenhagen’s Town Hall is an impressive glass mosaic window from 1905 - that decorates the portal - as well as portraying Copenhagen’s Coat of Arms from 1661 - probably with Bishops Absalon's Castle from 1167 - in the middle circle of the shield. King Frederik III of Denmark granted the coat of arms to the citizens of Copenhagen in 1661. As we receive numerous inquiries about the issue of getting married in Copenhagen and celebrating the wedding in the largest capital of Scandinavian - plus how to regain lost Marriage Certificates - we present a brief overview below regarding this trendy wedding subject. Every Year - and as for numerous decades way back in time - countless pairs and citizens from abroad - cheerfully select Copenhagen Town Hall - as their favourite Marriage and Wedding Venue - and the final romantic destination to give their vows to each other - and then live happily ever after. The Town Hall of Copenhagen provides the natural and cosy wedding atmosphere - as well as historic surrounding to tie the famous knot after a happy and amorous wedding ceremony. After the wedding service there are numerous ways and places to celebrate the wedding occasion in Copenhagen - as the city has plenty of exciting and surprising venues to offer in and around Copenhagen. Select Copenhagen as your Marriage Venue - and practice the easygoing way to conduct a romantic wedding at the City Town Hall of Copenhagen. Whether you are boarding a Cruise Ship - or leaving a Cruise Ship - or just on a turnaround Cruise Ship - and have Copenhagen as your Cruise Destination Port of Call - then it is quite easy to have a romantic wedding at the famous Town Hall of Copenhagen - and then continue your journey as a happy newlywed couple - with a memorable and legal Marriage Certificate in your hand after the wedding service at the Town Hall Copenhagen - or at other exciting - embraceable and beautiful venues in and around Copenhagen. A Church Wedding is also a popular option in and around Copenhagen. Get married in the Palm House of the Botanical Garden in Copenhagen all year round - or arrange a romantic wedding service in the beautiful outdoor landscaped garden areas in the summer time. 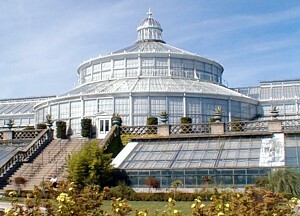 The Botanical Garden was established in 1872 - and is a popular wedding venue plus the Copenhageners devoted outing and picnic oasis. Cruise Passengers visiting Copenhagen can get married at Copenhagen's Town Hall - or other romantic wedding venues - like on a historic wooden schooner - and then continue their wedding arrangements with a memorable and legal Marriage Certificate after the wedding service in Copenhagen. De Forenede Sejlskibe. It is quite easy to get married at the Town Hall of Copenhagen - and then obtain your final Wedding Certificate. Just contact the Wedding-Office (Bryllupskontor) at the Town Hall - and the competent team of employers and service personal will expertly guide you through the practical procedure of getting married at Copenhagen’s Town Hall. A wedding couple that decides to get married in Copenhagen at the City Town Hall - can select their own favourite registrar at the Town Hall to conduct their final wedding act in the ceremonial wedding hall - or at other selected wedding venues in Copenhagen. In some cases it could be one of the Mayors or the Lord Mayor if preferred. For lost - regain and renewal of previous Marriage Certificates that are issued at the Town Hall - contact the Wedding-Office at the Town Hall. Marriages between foreigners - or Performa weddings in Denmark - does not trigger any type of legal resident permit or other welfare privileges - as well as additional social benefits in Denmark or in other EU-countries - but only the pleasure to get married in Denmark - plus using the wedding event on Danish soil - as an everlasting amorous memory between honest and truly loving wedding couples making their Vows in a Cute little Fairy Tale Kingdom. Contact your local Embassy in Denmark for further information. Many foreign and engaged couples select a church wedding in Copenhagen - and a romantic Danish church as their marriages venue - as there are over hundred historical and preserved churches in and around Copenhagen. Rådhuspandekager - the famous Town Hall Pancakes is served at numerous occasions and special events at the Town Hall - and is a culinary experience and delicious treat - for those - who really have a "sweet tooth" and lovers of astonishing desserts. Copenhagen is the perfect and romantic place for a Church Wedding - as many foreign and engaged couples select a church wedding in Copenhagen - and a romantic Danish Church - as their marriages venue. There are over hundred historical and preserved Churches in and around Copenhagen - some built way back in 1180 - during the High Middle Age. A Holy Church Wedding in and around Copenhagen is preferred by several foreign couples - as there are many beautiful venues in the city to conduct a Wedding Ceremony by a Danish Priest. There are almost 2000 Churches spread all over Denmark. The famous Town Hall Pancakes - Rådhuspandekager - was prepared - baked and served for the first time at Copenhagen's Town Hall in 1938 - and has ever since been the treat of the town - when special occasions are celebrated. For the wedding reception at the Town Hall - the lucky married couple can order to treat their wedding guests with the "worlds" most famous Town Hall Pancakes (Rådhuspandekager) from the in-house restaurant - which is a must to serve and taste after the wedding ceremony. 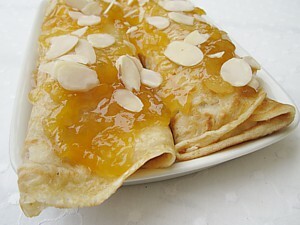 The delicious butter fried Pancakes - is a delicacy that briefly consists of soft vanilla cream - blended apricot jam with drops of Grand Marnier - whipped cream and flaked almonds. 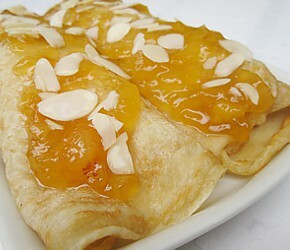 The first pancakes prepared - baked and served at the Town Hall was in 1938 - for prominent guests visiting the premises - and has since been a classic and delightful tradition to serve in connection with various celebrations - special occasions and extraordinary events held by the Town Hall. In 1967 - Copenhagen celebrated the city's 800 year jubilee - and used the Pedestrian and Shopping Street “Strøget" to create the world’s longest coffee table - by serving more than 800,000 cups of coffee - as well as 100,000 of the famous Town Hall pancakes. The genuine Town Hall Pancake recipe is still a great secret and owned exclusively by the Town Hall - and the top secret recipe is kept securely in the Town Hall safe. The present Lord Mayor of Copenhagen is Frank Jensen - who is a Danish politician - and member of the Danish Social Democrats. Frank Jensen has been Lord Mayor of Copenhagen since January 1 - 2010 - and - re-elected in 2017 - for a new four-year term - until 2021. Frank Jensen is born May 28 - 1961 - and is an educated economist - who holds a master's degree in economics from Aalborg University - which he received in 1986. Lord Major Frank Jensen is the 9th Lord Major of Copenhagen since the first Lord Major was elected in 1938. Beside of having many daily achievements and representative tasks - as well as administrative assignments - the Lord Major can conduct a wedding service if marrying couples prefer to be wed by the highest official represent of Copenhagen’s City Council - who also holds the golden keys to Denmark’s capital - and the largest metropolitan area in Scandinavia. So - come to Copenhagen and experience the best of both worlds - as well as a “once in a lifetime” - and "never forgotten" commitment and event. Contact Lord Mayor Frank Jensen - via email. 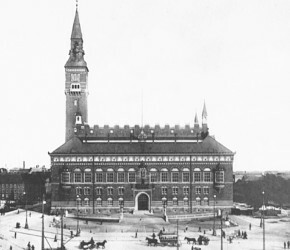 The Town Hall complex of Copenhagen was built during 1892-1905 - exactly where the former West Gate (Vesterport Gate) - the old Lucie Mill and Gyldenløves Bastion - was located and demolished in 1888 - to give space for the upcoming exhibition and New Town Hall building - which was inaugurated in 1905. The 107 metres high tower is equipped with a carillon that chimes its familiar tune all over the capital every day - and is a very dependable "must hear" sound for all Copenhageners every 15 minutes. Anyone is welcome to visit the Town Hall - and admire Jens Olsen’s astronomical clock - or climb the highest tower in the city with an outstanding view over Copenhagen and surrounding areas - as well as the Oresound Bridge - and the sea shores of Sweden under clear weather conditions. 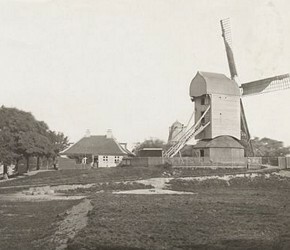 The Lucie Mill at Gyldenløves Bastion on Halmtorvet was demolished in 1888 - to give space for the New Town Hall and Square. 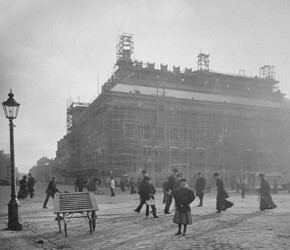 The Town Hall during construction in 1896 - without the tower that is slowly rising at the back. The building was completed and inaugurated in 1905. 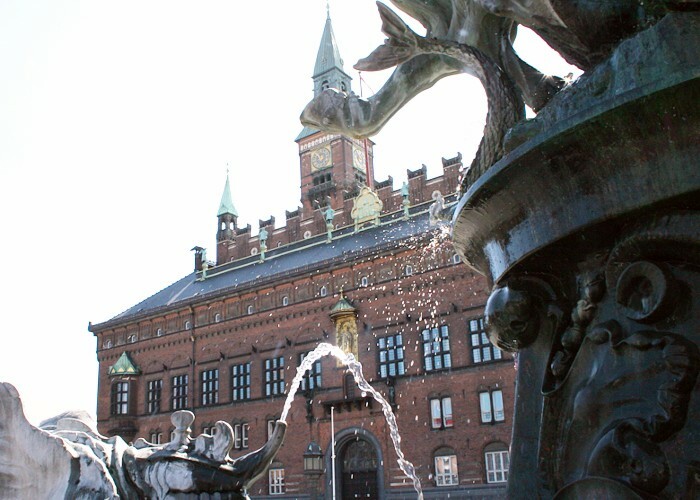 The Town Hall building in Copenhagen is decorated with a large numbers of sculptures and paintings and houses the local City Council and City Government of Copenhagen. The Hall is also used to welcome heads of states from other countries - as well as for civil marriage ceremonies. 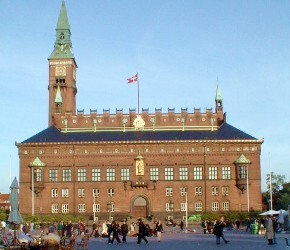 From 1420 - and until the present Town Hall was completed in 1905 - the City Council of Copenhagen was placed in five different buildings around the City. The Town Hall was completed and inaugurated in 1905. The horse driven tramcars in front are waiting for passengers and other commuters. The pompous Town Hall building in the afternoon sun - with lots of people and bustling activity on the Town Hall square. The City Town Hall is a very attractive and popular building - not only for outside visitors but also for the local Copenhageners. The entire complex is designed by architect Martin Nyrop - who based his project on the Italian Renaissance style - as well as on medieval Danish architecture. 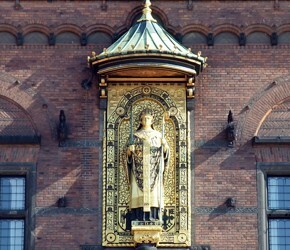 Above the main entrance is a figure of Bishop Absalon in gilded copper - who is the founder of Copenhagen in 1167. Experience the worlds most advance clock at the Town Hall designed by Jens Olsen - with 13 different clockworks that shows the exact time from all over the world - and the precise position of all planets. The Town Hall Grand Hall is a venue for concerts - exhibitions - cultural events - sales presentations - musical performances etc. 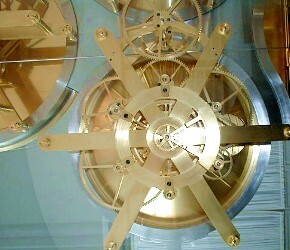 The most advance and precise clockwork in the world - with 13 different clockworks that starts the carillon to chime every 15 minutes - and the exact position of all planets. 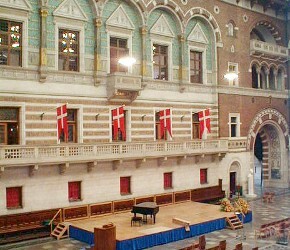 The Grand City Hall with sculptures and paintings og prominent Copenhageners - also offers many types of arrangements for the citizens of Copenhagen and other city visitors. The Town Hall square is the living stage of the city - and is bustling with great activity day and night. 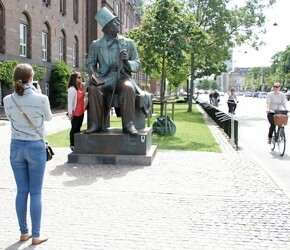 The Town Hall Square is situated right in the heart of the town together with the Zero Kilometre Stone - and a stature of the famous Danish writer Hans Christian Andersen is placed beside of the building - and just opposite Tivoli Gardens. The City Square is also a very popular meeting place and a convenient starting point for trips to explore the city by visitors and tourists. 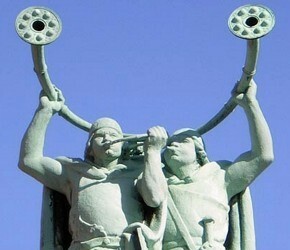 The Lur Blowers in bronze beside the Town Hall standing 20 metres tall on top of a column on tiles - was created and erected in 1911-13 for a Copenhagen Exhibition. Read their myth about virgins here. The Cycling Weather Girl is hanging high on the Richs-building on the corner of the Town Hall Square. 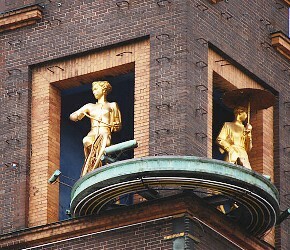 Her Golden figure is a welcoming sign - when she appears from her tower - then the sun is shining all over Copenhagen. On the corner of the Town Hall Square - the worlds longest Pedestrian and Shopping streets starts - and is one of the major tourist attractions of the city - and most hectic part of Copenhagen. 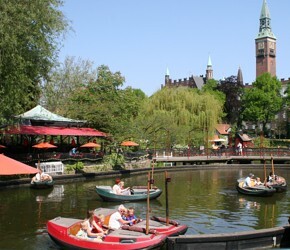 The Tivoli Gardens is located just beside the Town Hall Square - and is a popular amusement park with millions of visitors every year. 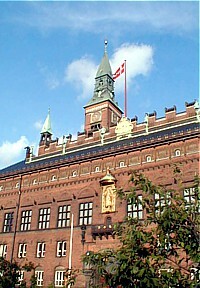 The Town Hall Tower rises as a familiar symbol of Copenhagen. The City Hall Information office offers Guided Tours at the City Hall and Tower - a visit to Jens Olsen's World Clock - and you are also welcome to visit the beautiful City Hall Garden in the middle of the City Hall building. 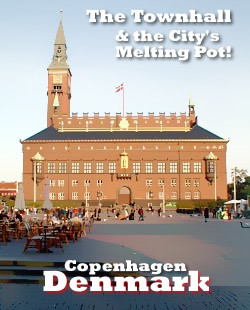 The City Hall Information office also provides visitors with extensive tourist information about Copenhagen. 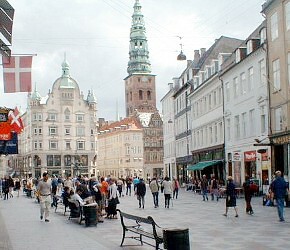 The Town Hall & Town Hall Square is located right in the City Centre - or at the very Mid Point of Copenhagen. The Central Bus Terminal is located at the Central Station.